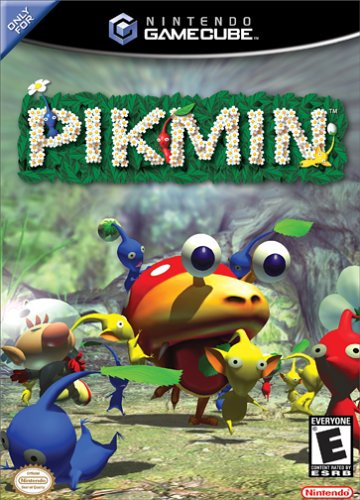 Filled with Nintendo magic, Pikmin will enlighten your life while it lasts. Pikmin is a game like no other we've played before, and we've played a lot. You control Captain Olimar, a space traveller who has crashed on a strange planet. During the crash 30 parts of his ship have been spread across the world. What makes this worse is that your life support system will only function for 30 days! Fortunately you soon discover Pikmin: plant like creatures who follow your orders and can be used to find your missing ship parts to get you home. 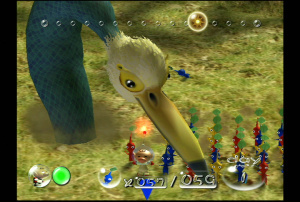 Even with the huge enemies that inhabit the world and 100 Pikmin on screen at once, there is no visible slowdown or pop-up. Like most 3D games the camera can sometimes be in the wrong position, but this is easily resolved with a push of either L, R or Z to rotate, zoom or toggle between overhead and 3rd person views, respectively. 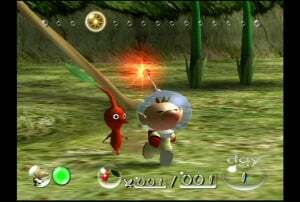 Pikmin doesn't fail to impress in the audio department either, with wonderful sound effects from the pop when you pull a pikmin from the ground, to the cute music that plays throughout the game. Despite not being Dolby certified, there are some surround effects, like when your spaceship takes off after each day. There are three variations of Pikmin that you will find throughout the game: red, yellow and blue. They have slightly different abilities and strengths which adds to the level of strategy. The controller is used perfectly with all buttons performing different functions, and this is one game where you won't need to look in the manual to find out which button does what: after one hour we guarantee you will know the controls by heart! The weakest part of this great game is its length: only 30 game days, which could be finished in a weekend. Depending on how many ship parts you collect you can view one of three endings, so make sure you go for the complete complement of parts. For added replay value, Pikmin includes a challenge mode where you try to grow as many Pikmin as possible in 1 day. Fantastic looking, sounding and playing, Pikmin is addictive but sadly easy and short. 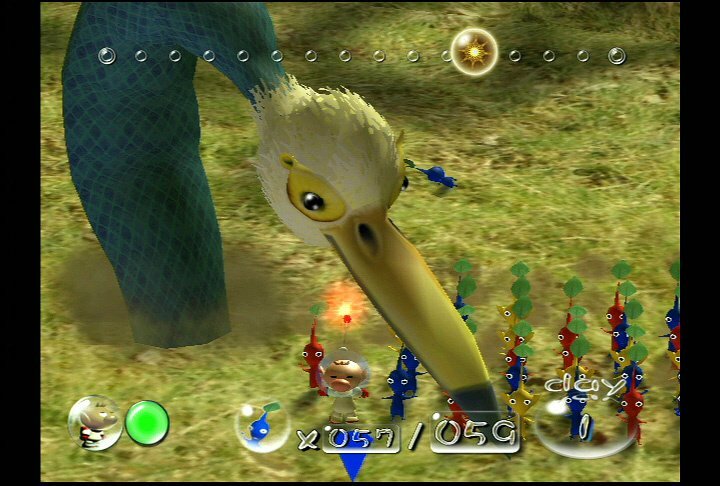 It's a shame that Nintendo adopted a 'shorter and more games' policy during the Gamecube era, but it did means there was a Pikmin 2 in short order. Pikmin deserves this score all the way and why no comments? Because its an underrated, unappreciated game. "It's a shame that Nintendo have started their 'shorter and more games' policy already, but then maybe it means there will be a Pikmin 2 sooner rather than later." This review is bad and old. It is too short. A re-review must be made! @Hyper Knuckles Remember that this is the reviewer's first ever review. This deserves a 10! Zelda gets a 10. Zelda is a horrible, ugly creation. Pikmin is a Reeses compared to Zelda's tofu. IT NEEDS A 10! Wow, the very first review on NintendoLife! Has the author even played Pikmin 2 and 3? !